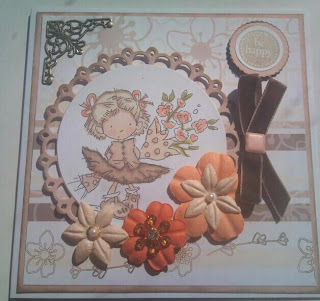 Hi everyone happy Sunday.I would like to share this Lilli of the valley card I made for a April card swap. I got some new paper the other day from Ryman,s to use with my stamps and promarkers.I am really pleased with the results.I am pretty new to colouring but am pleased with my new card.I hope you like it. Really beautiful card Lyn - absolutely stunning. Am well impressed with the blogging! I am loving this very much Lynn! Love the papers and the embellishments are lovely. Stunning, what a beautiful card and the image, just wonderful as is the colouing.